The lighthouse Capo Sant'Elia is on an old Italian Navy post. It has been built on the Monte S. Elia, in Cagliari. 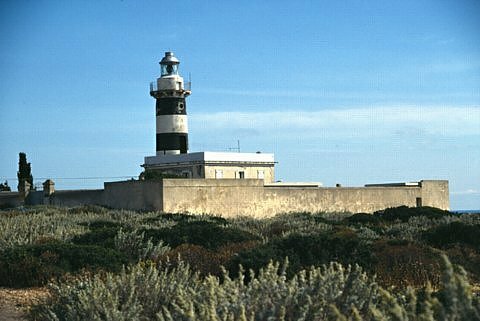 Here is some information about the town of Cagliari, which the lighthouse is near. Probably founded in the 9th century by the Phoenicians, Cagliari grew considerably from the 7th century onwards, with the presence of the Carthaginians who turned it into a busy and important trading base. It passed to the Romans in 248 BC. and two centuries later became a municipium. After the fall of the Western Empire, the city was dominated by the Vandals before being taken by Byzantium in 534. With the passing of the centuries, Byzantine rule became a mere formality, especially during the 8th and 9th centuries, when Saracen influence was particularly strong and the city frequently sacked and devastated. Autonomous and capital of the Cagliari Giudicato till 1258 when conquered by the Pisans who built massive fortifications, it passed to Aragon (Spain) in 1326, and then to Austria in 1708, before becoming a possession of the House of Savoy, and part of the Kingdom of Sardinia in 1720. After incorporation into Italy, the walls and other fortifications were destroyed, giving rise to urban development, particularly extensive after the last World War. Take one of the many ferries leaving various ports along the western coast of Italy over to the town of Cagliari on Sardegna. Leave the ferry and take a right onto Calata Roma. After 0.3 km Via Roma will merge into Calata Roma from the left. Stay on Via Roma. for 0.1 km then take a right onto Piazza Attilio Deffenu. Follow 0.17 km to the end. Take a left onto Via Cristoforo Columbo and stay on road for appx. 1.7 km. In less than 100 meters, Ponte Colombo turns into Circonvallazione Sud. Continue straight for 0.8 km when the road turns into Viale G. Ferrara. Again, stay straight. Stay on road for 0.47 km then go right (through a rotary) onto Viale Calamosca. Take Viale Calamosca for 1.1 km then turn right onto Via Faro. Follow the road to the end to Capo Sant'Elia. TOTAL distance - ~5.6km.